Lufthansa is running a decent sale from the UK to Asia / Middle East and South America at the moment. There are deals in all classes but I am just focusing on Business Class here. Details are on the Lufthansa site here but here are a few I pulled out. These are Heathrow return prices but you can also book from Manchester, Birmingham, Glasgow and Edinburgh. You need to book by 10th February for travel between 11th February and 4th April. Lufthansa Business Class is OK, but not life changing. 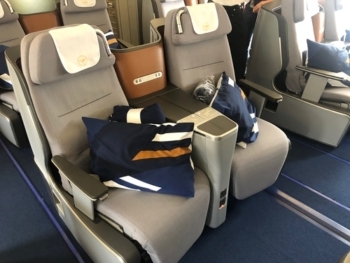 Here is my review of Lufthansa Business Class on an A340. It is usually a 2-2-2 configuration and, for the solo traveller, my choice is to take the middle block because the seat pairs are V-shaped. This means that your head is quite a way from that of your neighbour as the picture below shows. Your feet are virtually touching, unfortunately, but you can’t have it all! If you sit in the window pairs, the seats face forward so there is a smaller gap between the seats. The Lufthansa site is here. PS. Last night the Lufthansa website was advertising a £15 discount code, ZVJ0HQI9EIHL. This is NOT valid for flights to Beijing, Shanghai, Qingdao, Mumbai, Chennai, Delhi, Singapore, Buenos Aires and Rio de Janeiro but all other routes including short haul are OK. You must book by 15th February and fly before 31st March. Starting today and running until Thursday, Virgin Atlantic will be running a ‘two together’ discount as it winds up its January sale. Take a look at the Virgin Atlantic website here for details. voco is IHG’s new ‘conversion’ brand allowing existing hotels to switch to IHG without having to adopt the long list of ‘brand standards’ required to be a Holiday Inn, Crowne Plaza etc. You can learn more about voco here. The first UK voco was St David’s in Cardiff. This has now been followed by voco St John’s Solihull, which has presumably gained lots of yellow cushions, curtains and paintings over the last few weeks! This hotel used to be the Renaissance Solihull, one of Marriott’s brands, before it was taken over by Kew Green Hotels. Any clues on when the VS 30% sale goes live? They told me today and I was expecting it at midnight but …. The problem is that this came via Virgin’s marketing agency, not Virgin directly, and so you have another party in the middle with additional ability to mess things up. Mark got a link advertising that? TripRep…The VA home page is advertising “Extra savings when you book 2 or more people in premium”. I think the 25% off may apply to the current sale though, apologies. I’ve checked for the route I want and I’m seeing no change in prices. Not sure how widespread the “extra savings” are. Thanks. If it is Premium then I was misinformed by Virgin. OT- Question regarding BA Amex cards. If you were to use the free BA Amex with card year starting in January, reach £10k spend in December and upgrade to trigger the 241 voucher with the BAPP card which you then want to keep for the following year. Would you then have to pay the £195 fee in the December, then pay it again the following month at the start of the next card year? Must sound like a noob question, but still – how do I actually book Oneworld flights on BA website? I can see the flights I need on LATAM website (Santiago – Lima), but nothing there on BA. On a separate note, I have about 300K avios, 2 x BA 241 and 2 x Lloyds vouchers. What are my best options for Lima – there are no BA redemptions available for the dates I need. I could do London – Santiago via BA 24q, and then Santiago – Lima for cash, or are there better options (via Iberia, transferring points to LATAM etc)? If you’re talking about paid flights you have to book with the actual airline or a travel agent, unless BA offers a codeshare which can be booked standalone (else it needs to connect to a BA flight). I have used my 241 for London to Lima, avois redemption on Latam for Lima to Cancun (5.5 hrs though), and return on the 241 for cancun to London. Gets me a 2 centre holiday with Machu Picchu (Avios redemptions Lima to Cusco and return) and a beach break in Cancun. I did book it all as soon as flights were released, not sure what availability is like closer to the time……. I understand Platinum members can get one additional Plat then any combination of 4 Gold or Green cards. May I ask if there’s any difference between the Gold or Green cards? 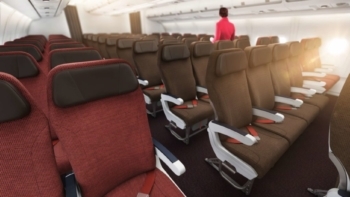 Does the Gold supp have any of the Gold CC benefits like double points on airline purchases? Or is the choice of Gold or Green purely aesthetic? I plan on getting my other half the Platinum supp and want to take out another supp but wondering if I should go for one over another. Aesthetic, as far as I know. You are NOT getting a Preferred Rewards Gold so no lounge passes etc. Amex Travel Offer query – I’ve got the spend £600, get £200 back: can’t tell from the T&Cs but is cumulative spend (i.e. multiple flights) ok, or does it have to be £600 in one transaction? Exactly the same fare in my experience (European short haul). But T-330 days vs T-355 doesn’t help. OT Lloyd’s upgrade voucher vs BA website. Have 2 vouchers in my name and Mrs name. Booked as two outbound with one voucher and the two return with the other. Seems to have led to a higher tax than pricing as a return x 2 passengers. Is this normal? It can work both ways depending on destination. Personally, I’m alwayshappy to pay a premium for 2x one way as it provides more flexibility. I have made an Avios booking in the past. I have now made another booking for different people for the same flight, all part of one family. Can I somehow merge the bookings so they will all sit together? If you are Gold, yes. Call BA, it is called TCP (‘to complete party’). If not Gold, no. You can’t do the more formal TCP by right but you can phone & get the bookings ‘linked’. This always worked for us when as a family we had 4 Avios tickets + 1 cash ticket, so 2 different booking references – they did some kind of informal TCP or linking so that we sat together. & stress the family aspect. yup, link PNR would work as well for non-Golds.